Internet Marketing is trending all around. Its competitiveness is arising a lot from the past few years. There are a lot of ways to get the maximum benefits in the Internet Marketing. The most popular ways includes to derive the traffic to one’s website or blog. Further there are methods like driving organic traffic and social traffic. Social Media sites are among the sites having the highest traffics. That’s why social media is very beneficial if someone wants to get traffic their online website or blog. The only reason behind the power of social media that millions of people all around the world use it to connect with each other on regular basis. But you should make right use of this power of social media to promote your matters or website or blog or any other online business. Even people use it to promote the offline businesses also. Today, I am going to introduce you with an awesome tool which will help to get all the required info to promote using the social media. It is an ultimate online marketing, search engine and social media automation research tool using which you can manage your online business like a professional. It is Ninja Blaster. It is a professional and premium tool which will offer you the features like researching about the keywords which should be relevant to prove you lucky in the matter of gaining traffic from the search engines or from social media such as through the thousands of Facebook groups. Ninja blaster focuses on Facebook too much that they have built many of the features especially and just for Facebook promotion and marketing research. So, let me now start reviewing this ultimate and professional online marketing or promotion research tool. Their official website is NinjaBlaster.com whose homepage screenshot, I have given below. When we have to review something new, for example a tool and especially if it is a tool related to managing your online business we should focus on its each and every benefit prior to having hand shake with it. That’s why to give a true review of Ninja Blaster. We’ll first talk about the features of Ninja Blaster and then we will also talk about the pricing options offered by it. It is a software which you need to first purchase and then need to install on your local pc. Although, these days a lot of products to do search engine marketing research or social media promotion are available but Ninja Blaster is among the Best tools for the same purposes. I have listed the features below, which will help to clearly have a look what type of potential this ultimate tool i.e. Ninja Blaster have to support your online business or promotion campaign. You can post in the groups which you have joined i.e. in the groups of which you are a member, you can choose the groups in which you want to post, you can select the image which you want to show along with your post, as the post scheduling is automatic, you can set the delay between the publishing of two consecutive posts and all of this you can do without installing the Facebook App. You can do this all in the automated way and get your brand or anything else with maximum gain. You can research about the keywords based on the Facebook groups in which you want to post and may also select in exactly how many groups you want to post so. All of this very fast and easy and hence also time consuming. You can do whatever kind of promotion you want to maximum potential and can improve your ranking unexpectedly. The Keyword research feature in Ninja Blaster works amazing. You just have to import the keywords, related to which the Best Keywords you want to be get suggested. All of this is a 5 level deep research procedure and thus you can find the Best Long tail or even short tail keywords you wanted and that will surely works the best to help you find the desirable or expected results. You can do this keyword research for 5 different Search Engines which includes Google and Bing also. Additionally it offers many small features. Such as Image or picture handling features using which you can do a variety of things with the images related to your research project or simply with the images you want to post. These features include the picture resizing which is again one click function. You can keep the image dimensions proportional to keep up the professionalism of the image. Some other features of this software which raises its standard are, it is regularly being updated, new features are added, adapt itself according to the occurrence of various changes. The support that they offer is also very good. Plus they also offer 3 days free trial. 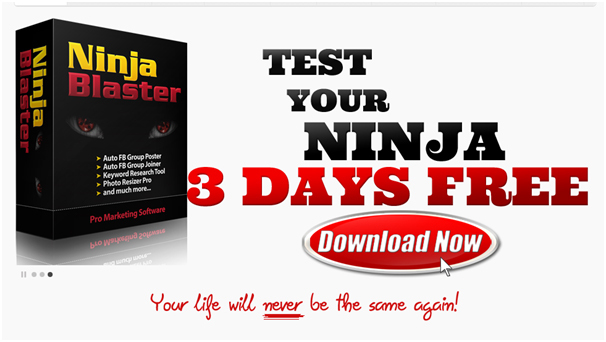 Using Ninja Blaster, you can promote your brand, can judge the instant results and can get the maximum traffic exposure as this amazing software has that potential to help you in this case. In short, you can do all of this in the best possible way with saving your lot of time and money too. This beautiful tool also includes an amazing Gmail Sender. It has the capacity to send about 500 Mails per hour and all of this at no additional cost which is very easy to use and you can make your promotion easy by importing unlimited mails. You can save the emails in text file. You can also manage your Facebook Fan pages using this tool. Simply, you can use this tool to update your Facebook Fan page or to schedule posts for your Facebook fan page. One this which is really awesome is that you can schedule multiple posts. And the post scheduling process is also just a single click away if you use this feature full tool Ninja Blaster. Quickly talking about the pricing, it offers you three simple options to choose from. First is the monthly plan which will costs you $9.95 per month, the second one is the yearly plan that costs you less comparatively with 80% discount and the last one is the unlimited use plan for life which will costs you $97. They are offering huge discount on their product if we look at the powerful features of this tool. Here is the screenshot of the pricing page featuring the discount. So, this was our review of the Ninja Blaster, hope it would satisfy your need to understand this incredible tool. So, why you are waiting? Buy this incredible all in one marketing tool today.